Mare Crisium is one of my favorite Moon areas. There is a lot of details inside Crisium, but it is not easy to detect, because it is very fine. High aperture telescopes are needed to spot the small impact craters inside this maria, because its typical lengths are 1 or 2 kilometers wide. The telescope used is a Celestron Nexstar 5SE and the camera is a Canon EOS 450d (Rebel XSi) DSLR. The picture actually is a mosaic made of two panes. 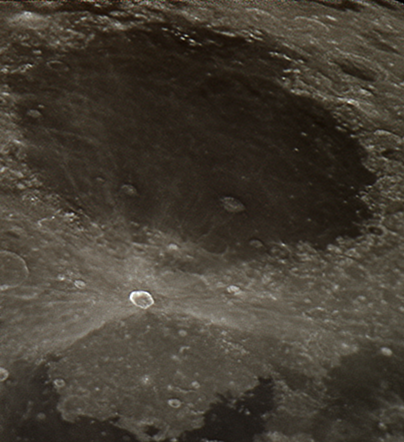 This entry was posted on 2011/02/28 at 3:55 pm and is filed under Astrophotography with tags Astronomy, Astrophotography, Canon EOS 450D, craterlets, craters, Impact crater, Mare Crisium, Moon, Palus Somni, Proclus, Rebel XSi, solar system, Telescope. You can follow any responses to this entry through the RSS 2.0 feed. You can leave a response, or trackback from your own site. your moon shots are great. as you used a 5 inch, may I be able to get something similar with a 4 inch ? Are you using eyepiece projection or just DSLR on the focuser ? And most of all, how do you focus so well ?!! Focus is a matter of chance and patience. If you try enough eventually you’ll get a sharp focus. Sure, with a 4 inch telescope, results could be almost identical. I used eyepiece projection. Another option is attaching DSLR to the focuser but reflector telescopes use to need a Barlow lens to reach focus.